We are nursing a sick child with a fever and haven’t been able to go see anything in Bangkok yet, but our own street corner is alive with extreme dichotomy. 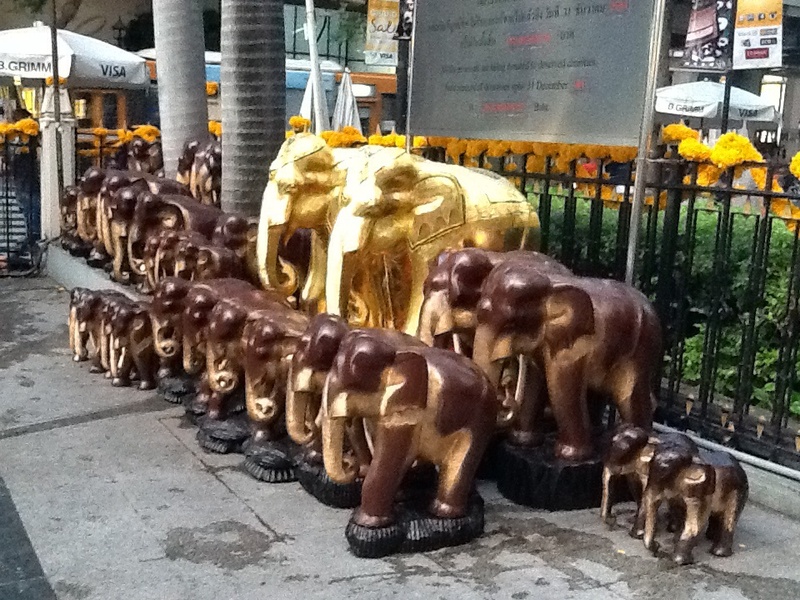 We are staying at the Erawan Grand Hyatt – it is probably the grandest hotel I have ever stayed in. There are at least six huge malls within spitting distance and we are nestled in between every luxury designer brand you can think of; Gucci, Louis Vitton, Stella McCartney, Lanvin, Alexander McQueen, Botega Veneto, you name it, it’s here. 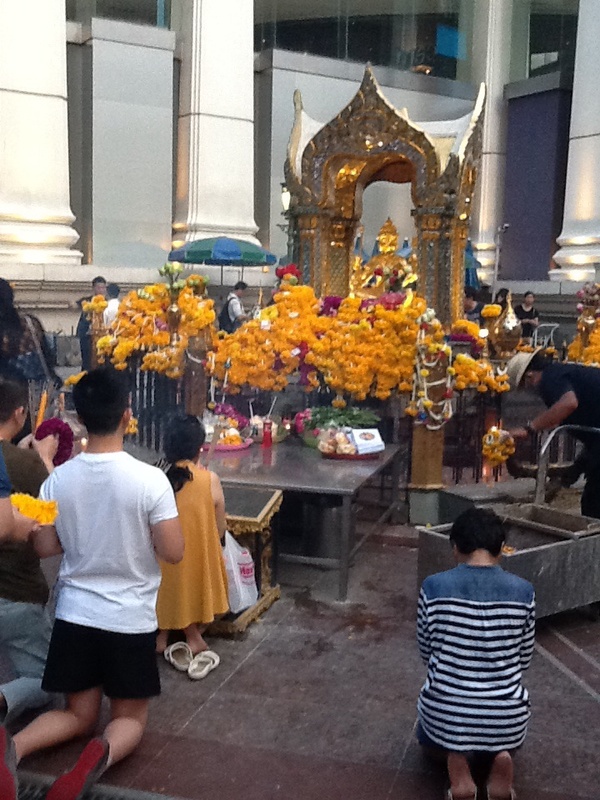 But on the corner next to our hotel is the Thai version of the god Brahma, installed when the original hotel was being built on this sight. They broke ground on an inauspicious day and the construction was going very badly. The shrine did the trick and all went smoothly afterwards. At all times of the day, there are stalls set up along the road with flowers, icons, and offerings for sale to those who come and pray. Thai dancers are paid by those who want their prayers to be heard. The space is a fog of incense and lit candles. 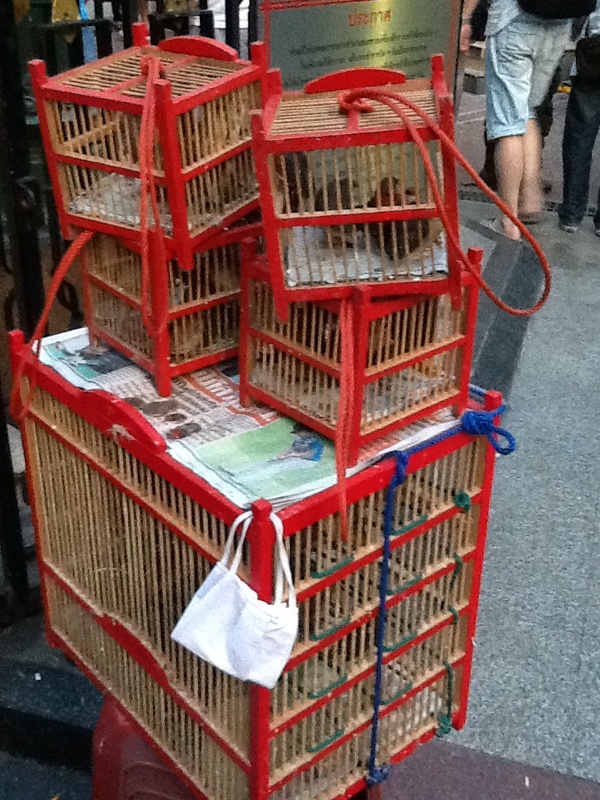 Birds in cages are waiting to be released for luck. A woman sits with three stray cats, she feeds them leftover fish on the sidewalk. In the evening, during rush hour the streets come alive even more. Vendors set up wares for sale and street food carts open up. This city is truly a place where East meets West. I think Ashwin’s fever has finally broken in the night (to our great relief). Maybe we will go past our corner today, but even if this is all we see of Bangkok, it is truly an amazing sight. It sounds like Ashwin is on the mend. Glad to hear it. Everything is so colorful there and interesting. Hope you can do your sightseeing today. Enjoy your day.